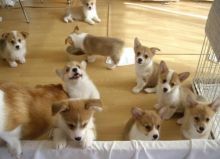 contact if you will love to get such Pembroke Welsh Corgi PUPPIES **They are perfect in every way! They are outgoing, playful, loving, and charming They are always so sweet and wants to please the home as they are well trained to be with you,kids and other pets. Email at kerryroland121@gmail.com text at (587) 318-4308) for more info and pictures.